710 Study San Rafael Neighborhood Posts: The 710 and Measure R2: Can Los Angeles Build Transit and Beat Its Addiction to Asphalt? The 710 and Measure R2: Can Los Angeles Build Transit and Beat Its Addiction to Asphalt? 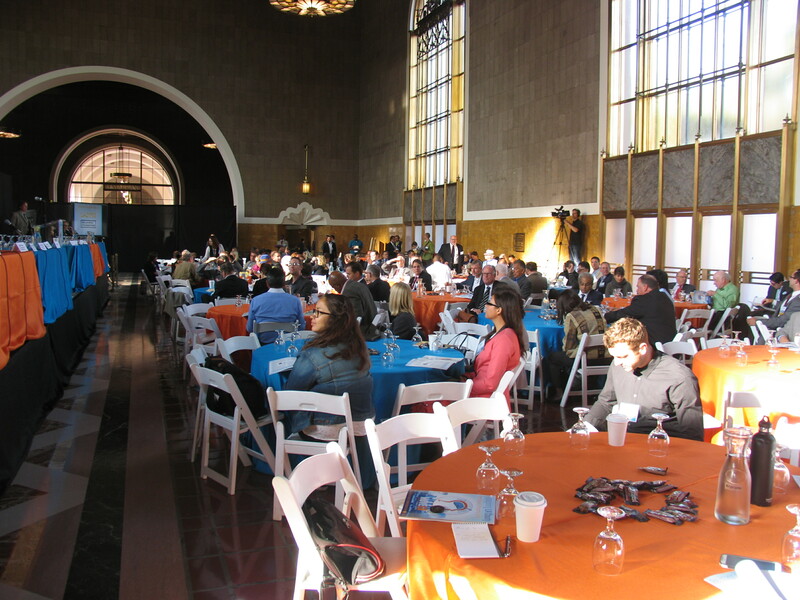 Mayor Eric Garcetti addresses attendees at the MoveLA Conference at Union Station. 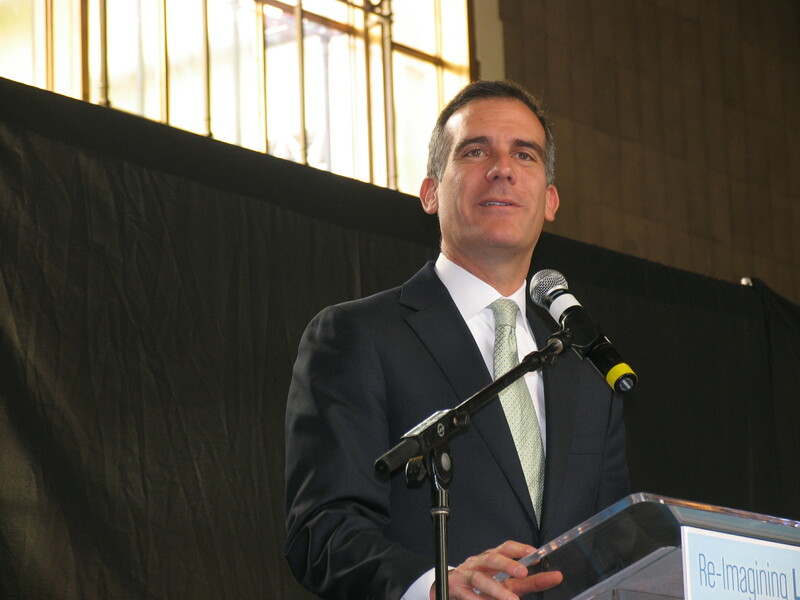 “We have to build an army of people who are willing to say ‘enough is enough,’” said Mayor Eric Garcetti at Wednesday’s MoveLA conference at Union Station, speaking of the region’s traffic and pollution problems. He was there, along with hundreds of other county and city leaders, drumming up support for Measure R2, a proposed sales tax measure to raise more money for transit. A recurring theme at the conference was the need to reduce the number of cars. Which made me wonder how R2’s successful predecessor, Measure R, ended up funding projects that will do exactly the opposite, such as double-decking the 710. In 2008, voters approved R’s half-cent Los Angeles County sales tax for a slew of transportation projects. It raises about $40 billion over 30 years. Denny Zane, former mayor of Santa Monica, founded MoveLA to push for this initiative. It grew out of a need to fund the Wilshire subway extension; Downtown Los Angeles, Koreatown, Century City, Beverly Hills, Westwood, Santa Monica — the “core” of Los Angeles stretches down the length of Wilshire Boulevard. Without a heavy rail “spine” connecting the region’s densest area, the entire transit network is handicapped. Denny Zane speaks at the Move L.A. Conference. But how do you convince someone in Encino or Alhambra to vote for a subway under Wilshire? And so Measure R incorporated several other transit projects and allocated 20 percent of its funds to highways. That’s why Metro and Caltrans have already spent millions on plans to double-deck the 710 and tunnel under Pasadena. 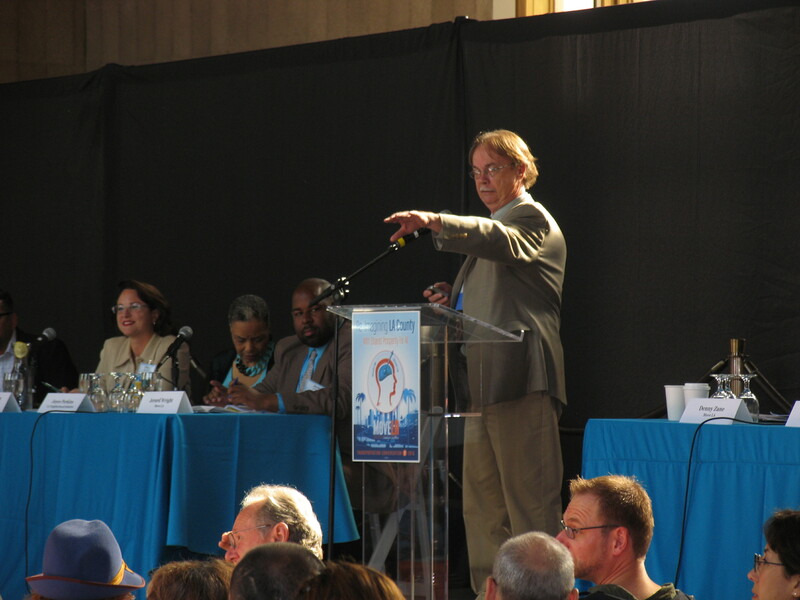 At the 710 debate at the Pat Brown Institute last month, even supporters of the tunnel echoed that “the time of Los Angeles building freeways is over.” Caltrans and Metro officials often concede that freeway widening will not reduce congestion, just before they talk about doing it anyway. It’s as if they’re drug fiends, struggling to beat an asphalt addiction—after just one more hit. The downside of Measure R is that it gave them a new stash. In 2012, Measure J, the “Jumpstart Act,” attempted to extend the sunset on Measure R by 30 more years, from 2039 to 2069. Measure J didn’t pass, despite winning 66.11 percent of votes, thanks to the legacy of Prop. 13 and its two-thirds requirement. At the time, it was a big disappointment for transportation advocates. But did we really want another $8 billion steered to freeways? Fastracks, Denver’s 2004 version of Measure R, funds transit only. Denver’s Phillip Washington will become head of L.A. Metro in May—maybe he can help sculpt Measure R2 to be more like Fastracks. Denver isn’t saddled with a two-thirds voter threshold, of course. But the passage of 2014’s Measure BB in Alameda County shows it’s still possible to pass a transit tax in California, even without the record voter turnout of 2008. Measure R was huge. But Los Angeles can do better in 2016. R2 still must appeal to a large region full of sometimes divergent needs. It promises to help fund the Great Streets Initiative and bike improvements, as well as providing capital to get transit built where it isn’t fully funded under R, such as the Sepulveda Pass. With that commitment, Measure R2 would be a game changer.